Figure 1 Comparison of wet etching which relies on chemically reactive species to leave an isotropic etch (top) to dry etching which also employs ion bombardment to give an anisotropic etch (bottom). Dry etching (also known as plasma etching) is the process of removing material by exposing the material to an ion bombardment to form a pattern. Unlike many wet etching techniques, dry etching is an anisotropic process, allowing for etching of flat, lateral walls. Most dry etch techniques employ reactive ion etching (RIE) which combines physical etching with chemical etching to achieve a balance of selectivity and anisotropy. The process of dry etching is widely employed in the microfabrication of circuitboards by etching of silicon substrates as well as in the design of microfluidic devices using materials such as polydimethylsiloxane (PDMS). In recent years, dry etching has mostly replaced wet etching for fabrication of circuitboards. Dry etching is mostly driven by reaction of chemicals in plasma state. The plasma increases reactivity of chemicals, etching via a physical and chemical basis. Physical etching occurs from the bombardment of neutral particles while the chemical etching occurs from charged ions. A silicon substrate coated with an etching mask, with the etching mask leaving free the regions of the silicon substrate that are intended to be anisotropically etched, is subjected to an initial etching step. For this purpose a gas mix containing reactive species like SF6 or nonreactive noble gases such as Ar can be used. The composition of gas used will affect the selectivity for substrate and the degree of anisotropy of the process. For example, since Ar is nonreactive, the majority of species will bombard the exposed areas, typically knocking off surface particles via nonselective momentum transfer when the ions have greater collision energy than the surface binding energy of the solid, removing and vaporizing the solid particles in a process known as sputtering. During the etching step, chemical reactive species and ions are generated in the reaction chamber aided by an electrical discharge of ionic species in the plasma. Figure 2 The mechanism by which dry etching occurs involves vertical bombardment of the surface and chemical selectivity to yield an anisotropic etch. Removing the dielectric layer and exposing silicon beneath. To perform dry etching the plasma must be generated first. The plasma is formed when electrons are accelerated to high energy states typically performed in high energy electric or magnetic fields using microwaves but more recently radiowaves. The plasma contains positive ions, electrons, reactive chemical species, and neutral particles all contained in one bulk state. Without a plasma, all the processes involved in etching require higher temperature. 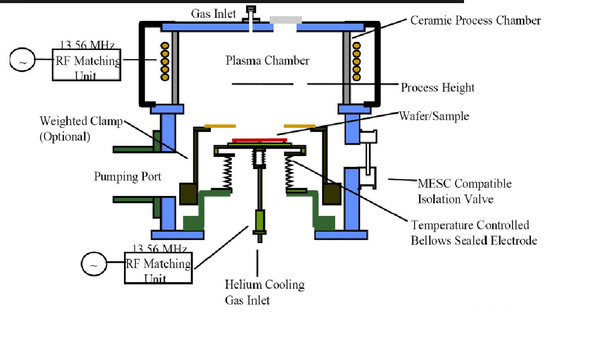 There are different ways to change the plasma chemistry and get different kinds of plasma etching or plasma depositions. One popular technique is to use an oscillating(AC) radio frequency wave to strip electrons from the gaseous species. The field accelerates electrons, giving them a high velocity to escape the gas molecules and create ionic species, forming the plasma. Using an oscillating field allows the electrons to accelerate back and forth between electrodes, gaining momentum and charging the wafer surface. The ions are then attracted to the negatively charged surface, bombarding and neutralizing the surface. The process then repeats in a cycle. Plasma etchers implement a form of plasma confinement to concentrate plasma into a region of the apparatus to allow control of etch rates and feature distribution. There are many parameters such as pressure, gas composition, gas flowrates, and supply power which can be adjusted to give desired etching properties. The plasma is confined by manipulating the properties of Debye sheaths which are transition layers between the plasma and solid. The Debye region is a result of the equilibrium formed from electrons bombarding the solid surface due to the higher electron temperature in comparison to plasma temperature, negatively charging it relative to the positive bulk plasma. This is tunable by adjusting the electric or magnetic field applied across the electrode. 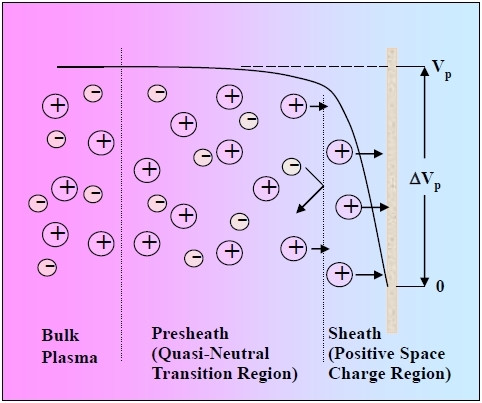 Figure 3 A Debye sheath is shown above with clearly separated regions between bulk plasma and sheath layer. Parallel plate etching refers to the apparatus used in RIE. 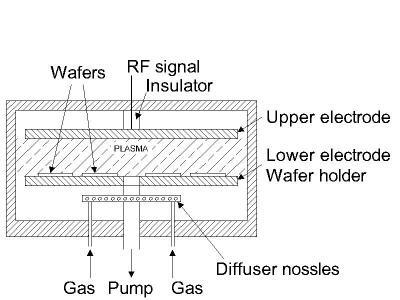 This mode of etching uses an electric field to generate the plasma, typically employing a small electrode to focus ions in a concentrated vertical direction to give a more anisotropic etch. The smaller the electrode area the greater the bias. By increasing the applied field strength, a greater degree of anisotropy can be achieved with deeper etches. Figure 4 A parallel plate plasma etcher diagram is shown. The apparatus uses a pair of parallel electrode plates to accelerate the electrons with an RF power supply. Inductively coupled plasma etching is a mode of etching in which an electromagnet is employed to generate a magnetic field for plasma production. This process doesn't require electrodes inside the chamber, thus reducing potential contamination. High plasma density can be achieved using lower pressures with this method, which allows a greater anisotropic etch to be achieved although greater damage to the mask and substrate can occur. Figure 5 An inductively coupled plasma etcher is shown above. The magnetic field is applied perpendicular to the wafer to accelerate electrons vertically. Notice the lack of electrodes in the apparatus. 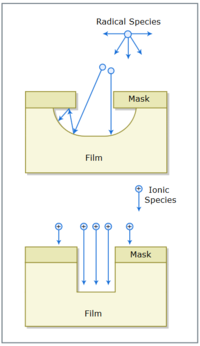 The Bosch process also known as deep reactive ion etching (DRIE) is a technique used to create high aspect ratio structures in silicon, allowing for very deep etches. It is able to etch defined features such as trenches, combs, and tongues anisotropically with a fair degree of selectivity in silicon substrate. The performance of this process, when done with microwave excitation (propagation ion etching) does not produce significant wall roughness. The Bosch process is widely used for obtaining relatively smooth sidewalls required for industrial applications in electronics and circuit boards. The process involves successive etching and deposition cycles to coat the sidewalls as etching progresses. Each cycle involves a typical ion bombardment and is followed with a deposition step of a chemically inert passivation layer (usually C4F8) on the newly exposed sidewalls, protecting them from reacting with chemical species, however there is a possibility of sputtering the layer on the sides although the majority of species bombard vertically on the bottom layer. Without the passivation layer on the sidewalls the ions would react with substrate as deeper etches are made, leaving undesirable isotropic etch patterns. However, due to the nature of the technique, repeated cycles do result in small undulations in side walls due to small isotropic steps occurring between cycles. The process has been applied to the manufacture of flexible circuit boards, however deeper trenches for stretchable electronics required a titanium/gold bilayer hard mask. Figure 6 The mechanism behind a Bosch Cycle is shown. The dry etch is first performed. Then a passivation layer is deposited on the walls. The cycle is repeated as many times as necessary. The technique leaves small undulations on the side wall. Dry etching is useful for materials and semiconductors that are chemically resistant and are not able to be wet etched. When used with photolithography, silicon dioxide can be applied or removed to trace paths for circuits for application in electronics. Dry etching is used in conjunction with photolithographic techniques to shape certain areas of a semiconductor surface to form wells in material for electrical contacts or circuit channels or to otherwise remove portions of semiconductor layers where vertical sides are desired. The process also sees use in fabricating lateral high aspect ratio walls for microfluidic device channels. "Dry Etching.” MIT Courses: Electrical and Computer Science (6.152J/3.155J). MIT Open CourseWare. ocw.mit.edu/courses/electrical-engineering-and-computer-science/6-152j-micro-nano-processing-technology-fall-2005/lecture-notes/lecture17.pdf. Tanaka, Hiro, et al. “Onset of Wiggling in a Microscopic Patterned Structure Induced by Intrinsic Stress During the Dry Etching Process.” Journal of Applied Mechanics, vol. 81, no. 9, Oct. 2014, p. 091009., http://dx.doi.org/10.1115/1.4027914. Etching Processes, MEMSnet.org. Retrieved 12 April 2018, from www.memsnet.org/mems/processes/etch.html. “BYU Cleanroom.” STS Multiplex ICP Etch | BYU Cleanroom, cleanroom.byu.edu/sts_icp. Roozeboom, F., et al. “Cyclic Etch/Passivation-Deposition as an All-Spatial Concept toward High-Rate Room Temperature Atomic Layer Etching.” ECS Journal of Solid State Science and Technology, vol. 4, no. 6, July 2015, http://dx.doi.org/10.1149/2.0111506jss. Garra, J., et al. “Dry Etching of Polydimethylsiloxane for Microfluidic Systems.” Journal of Vacuum Science & Technology A: Vacuum, Surfaces, and Films, vol. 20, no. 3, 2002, pp. 975–982., http://dx.doi.org/10.1116/1.1460896. This page was last edited on 12 April 2018, at 17:46.